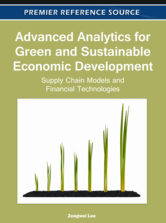 Advanced Analytics for Green and Sustainable Economic Development: Supply Chain Models and Financial Technologies focuses on the development of innovative techniques and tools that answer urgent questions in the global trend of sustainable economic development. This book will be useful to professionals, researchers, and policymakers working in various disciplines including business and economy, science and engineering, social sciences, government policy, and legal studies. Chapters in this work also provide a valuable resource for business managers concerned with the development of green business and application of low carbon practices.